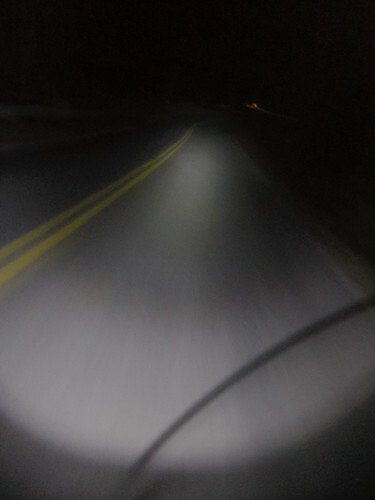 First, here’s a shot from a night ride last week. We had guests this weekend, so I didn’t ride much. 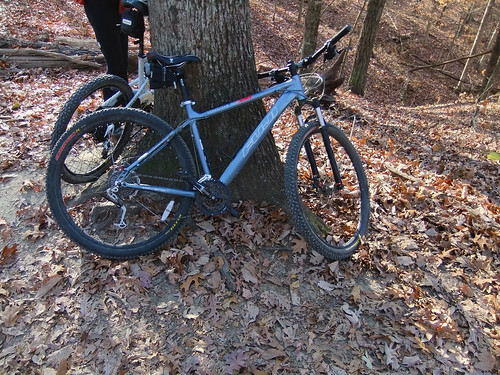 I did go mountain biking at Brown County State Park with Dave Saturday morning. We only rode about 9 miles, but it felt great to get out on the trails. I want to go back soon for more! These trails have amazing flow. This ride, while brief, was enough fun to make me think I should try to convince certain co-conspirators to come up and hit some trails, rather than gravel, sometime. We also tossed around some ideas for our traditional Black Friday mountain bike ride. This should involve some trails we’ve never ridden. I’m looking forward to it! 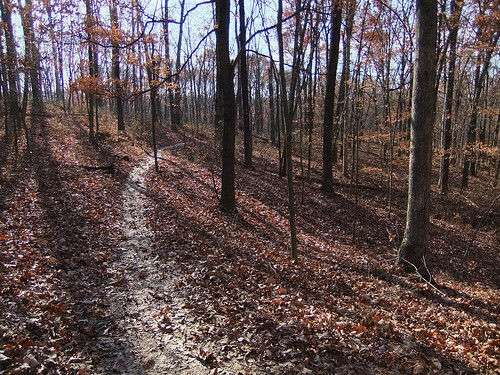 Trails=nice. Non-starting car with friends in tow=amusing story in 5-yrs time, but a real PITA right now. As to mtbike road trip, you make a persuasive argument. Means I might have to put the other tires back on the project. ‘course, those tires are terrible, so might necessitate even more tires. Fantastic night shot. I’m assuming no flash. How did you select shutter speed? Trial and error? I have trouble with these kinds photos. Tim: Bah, just use whatever tires you’ve got! Chris: No flash, and no real thought put into it at all, really. I just put my camera in its High ISO/Low Noise mode and shot. I did have to turn the brightness down later, to get the look I wanted, but overall it just worked. For what it’s worth, I probably took 5-10 different shots just like it and only 1 or 2 of them turned out looking decent. I love that first shot. Looks like you’re doing 100 mph!